Tom Derry, of Redford, MI, is as diehard a Babe Ruth fan as they come. 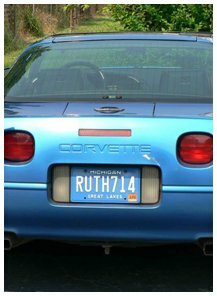 His Michigan license plate reads, “RUTH714.” His house is surrounded with Babe Ruth photos, trinkets and souvenirs. He is also the host of what is probably the biggest annual party commemorating Babe’s birth, aside from the Babe Ruth Museum’s yearly event in Baltimore. “I remember when I was young going to Tigers Stadium and really loving it. I always had an interest in the game and its history and the Detroit Tigers have a lot of good baseball history. Then I remember in the second or third grade, I got my first book on Babe Ruth. I always loved the old-time game most and I knew that Babe Ruth was the greatest, simply because of how dominant a pitcher he was in addition to a dominant hitter. I mean, if he had continued to pitch, it’s quite possible that the Cy Young Award could have been named the Babe Ruth Award. There’s no doubt that he’s the greatest homerun hitter who ever lived. I know he would have hit over a thousand homeruns, if he had as many at-bats as Hank Aaron did and he hadn’t started out as a pitcher. But I like the fact that he hit less homeruns and also was such a dominating pitcher for 4 or 5 years. It just shows what a complete player he was. He had a great arm. He could run the bases. He did everything really well – just a natural. He had that power, right when he walked out of the doors of St. Mary’s. He is the greatest figure in the history of the game. Everyone always says that he saved the game of baseball after the Black Sox Scandal and he probably did. There are a lot of players that get a lot of hype for a few years, but then they die down… but the Babe lives on. Like that New York newspaper said in the 1920’s, ‘The Ruth is mighty and shall prevail,’ and he does. Maris can hit his 60 homers and Bonds can hit 70 or 80. It doesn’t matter; Ruth will live on. He will always be recognized as the greatest slugger in the game. TS A1: “The party started in 1988. There’s this old bar in Detroit that my friends and I used to go to and always played this birthday song that annoyed the old lady that ran the bar. I used to come in with all these pictures of old-time ballplayers and I used to always know who’s birthday it was and I would say, ‘Hey, it’s Ty Cobb’s birthday’ or ‘It’s Jackie Robinson’s birthday’ or ‘It’s Walter Johnson’s birthday’. So we’d all look forward to the next birthday coming up and we’d celebrate at the bar. Then we got to February and we realized that Babe Ruth’s birthday was coming up and we said to ourselves, ‘Now that calls for a real party’ – because Babe was all about partying, living big and enjoying life. Babe Ruth and a party just went together. So we started the first year by sending out 15 or 20 invites. About 10 or 12 people came and it was a lot of fun. Then the next year we had about 40 people, then the next year 75, then a 100, 150, 200… and now we have about 300 people coming to the party each year. Even though it’s always been a word-of-mouth party, we have people coming in from all over the United States. We’ve had people fly in from Alabama, Utah, New York, Minnesota, Pennsylvania, Ohio – all over the U.S. The same people come every year. We also have a lot of the stuff that Babe enjoyed. You know, some of the obvious stuff, like the hotdogs and beer, and the cigars. But we also have Babe Ruth facemasks, buttons and a ton of balloons. We try to come up with different stuff every year.